It's almost Christmas, I'll put GT7 release date next year, right around Black Friday. Or hopefully on the last race of the F1 season, LeMans, or Monte Carlo/Indy. So in anticipation of this event, I'm asking you guys several questions over the next week for what you would like to see (IE tracks, features, modifications, and other things). Today's question is what cars do you most want to see? 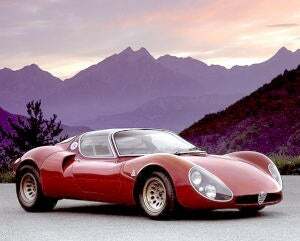 I'll just say 1 so you guys have something to comment about, but I don't think an Alfa Romeo 33 Stradle is mentioned enough in these types of list, and would do greatly as a $20million car. Especially an older one, with the dual headlights as shown above.